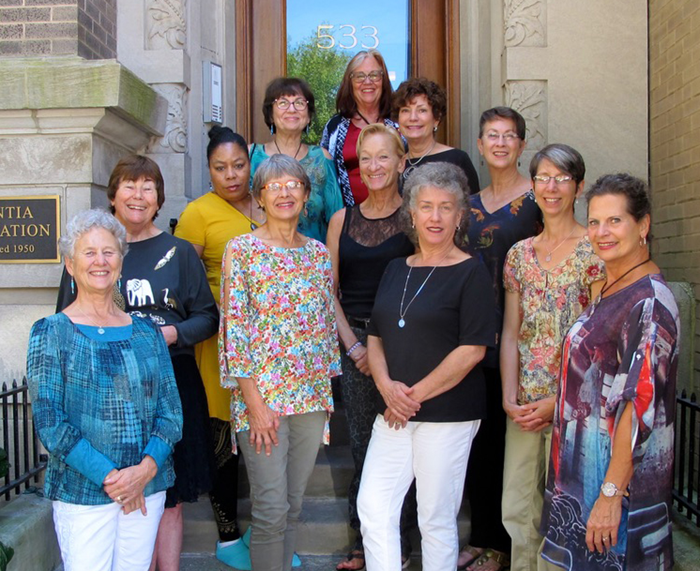 The second floor of 533 was blessed with prayers, laughter, and tears by participants in the Dancing with God retreat, facilitated by Carrie Prentice, Doreen Heyne, Katharina Becker, and Line St-Pierre—the “Daughters of God” team. Among our group of 14 women, we had the immense pleasure of hosting a guest who came from South Africa to literally “see if Urantia Foundation was real.” How delighted she was to find out that not only was the Foundation real, but many students of this revelation were courageously living God’s love around them in the world even amidst challenges and life crises, which was the sub-theme of the retreat. Throughout the weekend, we experienced transformation through the Spirit, united in spiritual essence for our eternal destiny. The Daughters of God group would love to share this model with other groups to help them encourage more women to appreciate their value and calling. If you would like to experience this retreat, we would be happy to travel to your retreat site to meet with your group. If you plan a date, gather six to eight women, and reserve a venue, we will commit to meeting with your group. We look forward to empowering more women to follow their spiritual longings for sisterhood and outreach. Please contact Line St-Pierre for more information at [email protected]. I left the women’s retreat with a mixture of exhaustion and renewal of spirit. My soul was full and sore, having been stretched, maneuvered, and reformed. I had taken in the stories of other women whose wounds, pains, problems, and concerns echoed my own. I understood them, I cried my own tears for them, and I prayed with them for better days. I had taken in their smiles and their laughter, their stories of love and family, and I prayed with them for more days of this ahead. I had taken in a unique experience of sharing, listening, growing, unfolding, and unseen awareness that will linger in my conscious and unconscious self for many days to come. My personal breakthroughs that weekend allowed me to leave 533 W. Diversey Parkway with a greater capacity to shine my love out to the world as I acquired an inner glow that felt palpable. I left a lighter, brighter, more confident version of myself, which God didn’t hesitate in rewarding—quickly. It was on the plane heading home to South Dakota that I found myself sitting next to an older man, a Vietnam veteran, of bright spirit and warm heart. Our conversation began even before buckling seat belts, as the thread of God and spiritual living embraced us in a cocoon of safe sharing. We offered stories and knowledge to each other, which turned out to be vital for each other’s next steps in life. We exchanged hope, inspiration, and information that we both needed to continue our current work, God’s work, on earth. To say my love for this man was almost instant is not a far stretch. The moment I looked into his eyes, really looked, I knew I was speaking from my light directly into his, and his light was speaking back into mine. When the plane landed, I felt disappointed to leave him and say goodbye. I knew our instant friendship wasn’t over, but just a beginning to something greater. I saw him briefly again the next day, and we had lunch together the day after that. My heart has grown three sizes from meeting this beautiful man. Together we’ve inspired each other to move forward in places where we perhaps felt stuck: for him—writing his third book; for me—helping support a dear young man without parents in his efforts to get into college. I don’t know how God intends to weave our lives together in the future, but for now I am content, as I just had a most remarkable dance with God where I courageously lived his love, and for that I am most grateful. I truly thank the women of the retreat, God, my Thought Adjuster, and all the spirits that move us to do what’s right, without hesitation and without getting in our own way. I am a lighthouse, shining bright into the darkness to light the way for others to see home. May we all find this light within ourselves, for when everyone in the world comes to shine this way, we will finally see the true brilliance of God revealed.